Happy Spring! That means warmer weather, more rain (and flooding), and more debate at the Iowa Statehouse. Our hearts go out to communities reeling from the widespread flood devastation. It’s a reminder of the power of nature and, unfortunately, of what is becoming a new normal. Many Nebraska and Iowa farmers are already at a disadvantage because they’re close to the financial breaking point. The price tag for this catastrophic record flooding in the Midwest will likely be over $1 billion when agricultural losses are included, according to some experts. And, things are made worse by the toxic combination of flood waters and factory farms. You’ve been sending and sharing images that show how this flooding future and factory farms don’t mix. Members in Story Co. have images of flooded fields where a 5,000-head hog factory and manure pit will be built. Some of these fields drain into a creek behind Story County homes and a park. Members report calling the Iowa DNR with concerns about overflowing manure lagoons and manure that was spread on frozen ground. They hear that it could be days before they get a response, because overwhelmed and understaffed DNR agents are already out in the field investigating overflows. Before the flooding hit, we reported that the DNR issued 110 “emergency exemptions” this winter, allowing factory farms to dump untreated liquid manure and raw feces on to snow covered ground in the past three months. Now that the snow has melted, that’s even more factory farm waste draining into rivers, lakes, and streams across the state. It doesn’t have to be this way. We can act on climate now, and be fully ready to handle the climate chaos that threatens our people and our planet. We’ve been saying for years that we need our DNR and our elected officials to do more. The time for action is now. Congratulations to CCI member Eric Giddens! First off, we’re excited to have one more ally in office! A big CCI Action shout out to Cedar Falls member Eric Giddens, who just won a special election for Iowa’s Senate District 30. He won by a whopping 2,000 vote margin, in an election meant to disenfranchise the student population in the area. A huge thank you to everyone who door knocked and made calls to help make this happen! Spend $12 million each year to make it harder for people to get healthcare and food stamps with Senate Files 538, 334, and 430. Use this page to write your representative and urge them to vote NO on any proposal that places additional work or reporting requirements on Iowans receiving SNAP and Medicaid. Make it harder to implement conservation practices with public lands (Senate File 548). We do have a fighting chance in the House, where massive public support could peel off enough Republican votes to stop these bad bills. So use the links above to contact your legislators! We also heard a rumor that the Iowa Water and Land Legacy sales tax increase could be in play, with a push to alter the funding formula to move even more public money to Farm Bureau backed projects instead of our parks and natural resources the trust was designed to support. We’ll let you know the second we see action on this. And we’re still tracking bills to suppress voters – especially young voters – and a bill to politicize Iowa’s judicial nominating process. The second funnel is two weeks away, so action on these issues could be coming quick. Thanks for hanging in there with us. We’ll let you know when your call can help us have a big impact. Read on for more on these issues you can raise at weekend forumsnear you today and tomorrow! A week ago, hundreds of thousands, or perhaps millions, of students in at least 112 countries walked out class for the largest youth climate action in history. Youth movements across the country are joining together to deliver a message loud and clear to our political leaders: it’s time you start taking our generation’s survival seriously. Global politics is changing because young people stepped up to organize these climate strikes at their schools. 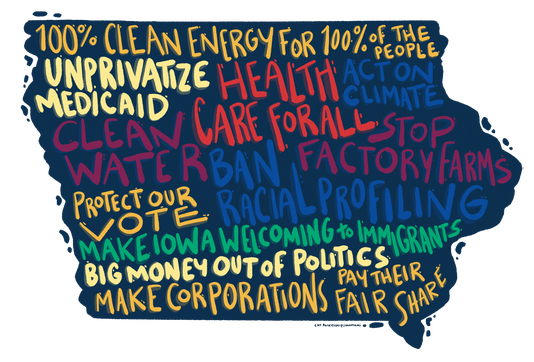 We’re taking part in the Road to the Green New Deal event on April 22 in Des Moines to keep up the momentum this spring. Reserve your tickets for the Des Moines event on April 22, 2019. We’re in a special moment. Young people have catapulted climate change to a top issue in American politics. We have an opening unlike anything we’ve seen in our lifetimes. You may’ve seen CCI’s name in the news with recent reports that Senator Sanders has hired his Iowa campaign staff. At the top of his list are three former Iowa CCI organizers. To me that goes to show that CCI trains and develops some of the best organizers in the state of Iowa and across the country. We congratulate Misty, Evan & Jess on their new positions and look forward to seeing how they continue to lift up our narrative, theory of change, and work for a better, more just world for all people through this campaign. BUT, we’re even more excited about CCI Action’s presidential endorsement process that kicked off this past weekend. A team of 32 top leaders from across the state have agreed to stay out of picking a team in the race just yet, and instead act as a collective to assure that our issues are a central focus of every presidential campaign which comes through the state. In April, we will send a questionnaire written by our endorsment committee to all candidates. From June to August, our Presidential Leadership Team will hold screening calls with selected candidates to dig deeper into their questionnaire responses. Later on this year, we will send out a member survey to gauge the support of our larger member base. We expect to have an endorsement in November. Back in November of last year, the CCI Racial Justice Team and members of the community presented a proposal to the Des Moines City Council which would combat racial profiling by the DMPD. The council promised the community they would report back on our proposal in February or March of this year. We’ve been patient, we have waited, and now we want to hear what’s been promised to us. So far, we have heard nothing from our local elected officials.It’s time to show up in force and remind them we need to see real action on this issue. Join us on Monday! If we show up big, it’ll send a strong message to the city (and other cities in the metro) that we need more than lip service; we need real action now to stop racial profiling in our communities, and we won’t give up!